Imprint Method: Unimprinted - Let everyone know where to go to get exactly what they need with this 5 pc Auto Tool Kit! It's perfect for every car owner to have in their trunk in case of emergency. Inside of a soft-sided, durable, zippered case (measuring 10 1/2" x 10" x 3") with a pre-printed warning symbol on one side, recipients get powerful 10-gauge jumper cables with 250 amp clamps, a rain poncho, hand crank flashlight, ice scraper, and tire pressure gauge. This is a great item to offer at a hardware or auto shop. 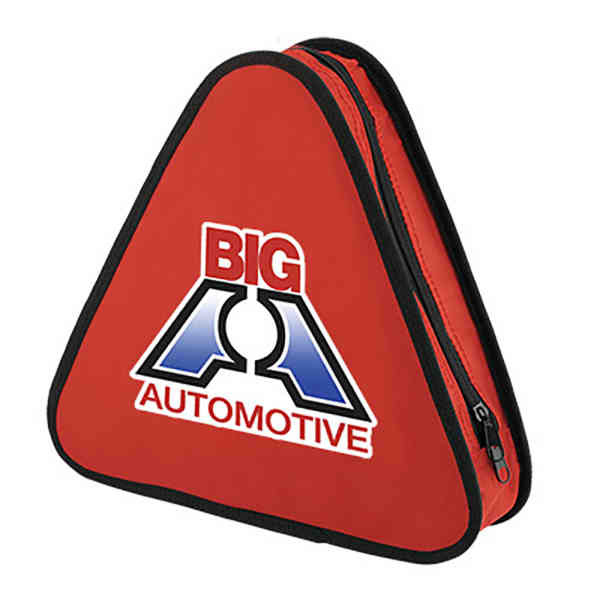 Add an imprint of your logo and get business rolling! Synthesis.